Shoojit Sircar’s Madras Cafe, starring John Abraham, Nargis Fakhri and debutant Rashi Khanna, is a film that moves away from any conventional Bollywood flick, and is one that embraces a true story of bloody warfare. It’s packed with all the thrilling intense action scenes, evokes a sense of poignancy and has to be one of Sircar’s most interesting directorial films. In the early 1980s, the Sri Lankan civil war broke out, in which hundreds and thousands of civilians were tortured, left homeless and killed as a result. 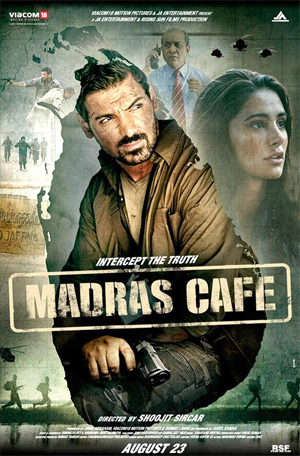 The massacre went on to become one of the most gruesome and tragic events to take place in South Asia, and Madras Cafe is a politically engaging story that follows these gruesome state of affairs. John Abraham, who plays the character of a RAW Intelligence officer – Major Vikram – is attempting to find leads into why the ferocious Anna (played by Ajay Ratnam) who is head of the LTF is against bringing an end to the painstaking war against the minority Tamils. Vikram’s life remains in danger amidst Jaffna and his undercover status is slowly revealed across the LTF territory. However, one British based political journalist who has more leads than anyone else is Jaya (played by Nargis Fakhri), and her character works to help Vikram with uncovering the truth. Although Vikram intends to help build a peace resolution, he realises soon enough that an internal conflict exists very much in the Indian bureaucracy, in which his own colleagues turn against him. As such the second half of the film involves just as much around this catastrophe as much as it does with uncovering the LTF’s next big movement – to assassinate the ex Prime Minister of India. It is in fact post interval that the film becomes increasingly more engaging and traumatic to watch, with the climax of the film leaving one speechless. John Abraham is given the opportunity to digress from his conventional machismo films and in fact surprises audiences with his fine performance. It has to have been one of the toughest roles that Abraham has been a part of, yet the ease and naturalness in which he executed the character of Vikram must be applauded. Nargis Fakhri, on the other hand gives a rather average performance. Her expressionless face almost makes her dialogue execution appear somewhat forced that it becomes difficult to appreciate her character and her journalistic role. Debutant Rashi Khanna has very little screen presence, however, playing the role of Vikram’s wife one can comprehend with the way her character is left distraught. The reason Madras Cafe works is because it does a magnificent job of delivering a true story with great conviction, which has the power to evoke historically moving memories for those aware of the Sri Lankan calamities. There is nothing overdone about it and with the deliberate choices made to have no song and dance within such a genre of a film serves well to portray that sense of realism. Whilst its debatable as to how many different types of audiences Madras Cafe will appeal to, I do think this film should be given merit for delivering a visually factual story that is not merely attempting to break box office records.